Four-year-old Roni could not wait to bring his mother to the "Animals in the Wild" Family Festival at Carnegie Mellon University's Children's School. "He enjoys this event. He told me all about everything beforehand," Yulia Rabinovich said. No different from fifty years ago when the early education center was founded, children are excited to show their families what they learn and do at school in Margaret Morrison Hall. Family Festival is designed to be student-led to allow children to switch roles with adults as the experts. They could tour nine rooms of demonstrations, displays, activities and games by 96 preschool and kindergarten students. Yoga sessions encouraged children to stretch into dog, kangaroo and frog poses. Wall-length bulletin boards displayed woodland landscapes, and a birthday board used animal shapes to mark the dates of each child's birthday. Sing-alongs and dance music played. Linda Hancock, educational administrator at the Children's School, described the theme as comprehensive, down to small details such as what to have for snack. "We've focused on native Pennsylvanian wildlife so children are really learning about the habitat in which they live," Hancock said. Using Zoomy microscopes that are easy to hold, the students showed parents how to magnify their skin, hair and even some worms. Families played a seek-and-find game with owl pellet dissection kits to locate and identify small animal bones. The teachers decide on a theme in the spring for the upcoming year to weave into the curriculum and then spotlight at the festival. Children's School Director Sharon Carver describes it as a "common thread" through the age groups. Carver asked the Humane Animal Rescue Wildlife Center to meet teachers to talk about how to present key wildlife concepts. In previous years, they met with Attack Theatre and the Pittsburgh History and Landmarks Foundation for guidance on theater and city themes. "We seek ways to collaborate with Pittsburgh organizations to give the school and families a tighter connection to the community," Carver said. Between making bird feeders and pointing out the necktie snakes they made, the Family Festival gives children the chance to teach their families about animal adaptations in diverse habitats. Parents also gain a fuller appreciation of early childhood education. “We are so intentional and creative in bringing the theme to life at the children’s level, and the children’s interest and curiosity takes us even deeper into the exploration than we envisioned,” Carver said. 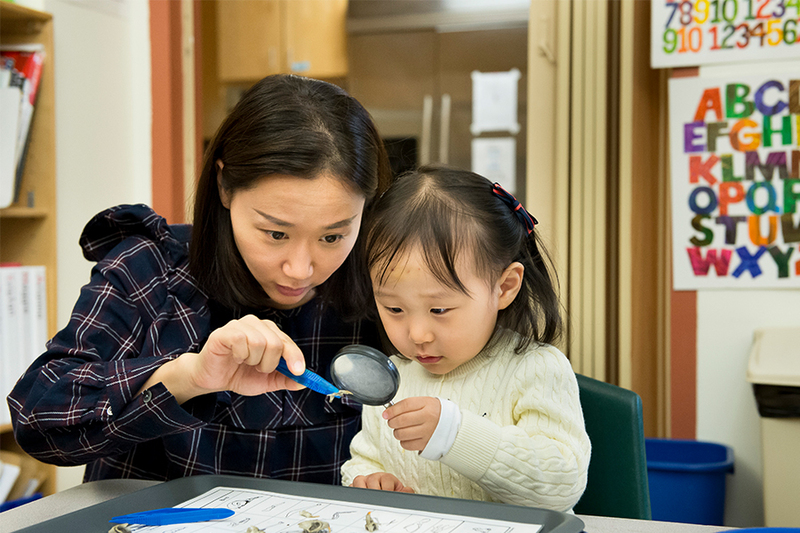 Pictured above are Ji Hyun Lee and her daughter SeoYi investigating owl pellets.